Probiotics are live bacteria and yeasts that aid in gut health. Most people think of bacteria as being bad. That’s true in a lot of cases, but there’s also ‘good bacteria’ in our bodies that help promote healthy digestion. Studies have been conducted on the effects and benefits of probiotics in humans, but research into probiotics for dogs and other pets is just beginning. However, many vets, breeders, and pet owners have seen their dogs’ immunity and digestive health improve after adding probiotic supplements to their food. Digestive issues are a common reason for illness in dogs leading to time at the vet, so finding a simple solution would be amazing, wouldn’t it? Probiotics can be used to help dogs with issues like diarrhea, gas, bad breath, allergies, and more. Once these problems are cleared up, owners may choose to keep their pets on a maintenance dose of probiotics to keep their digestion and immunity on track. Owners thinking of treating their dogs with probiotics should consult their vet and be aware that not all products are created equal. It’s important to know what to look for and what to avoid if you want to buy a quality probiotic that works. Note: Always consult your vet before giving your pupster any medications or supplements. If you’re in a hurry check out Miracle Probiotic. This is the best dog probiotic to help your dog maintain optimal gut health since it contains over 360 billion CFU probiotics per jar, 6 researched strains of probiotics and is 100% made in the USA. What Can Probiotics Do For Your Dog? ​Probiotics are microorganisms that provide benefits to humans and animals when they are ingested. The main benefits that we know of are that probiotics contribute to a healthy digestive system and a healthy immune system. Probiotics help balance out the bad bacteria in your gut to help prevent things like infection and inflammation. ​There are diverse types of probiotics, known as strains. Two of the most studied strains of probiotics that you might be familiar with are Bifidobacteria (used in foods and supplements) and Lactobacillus (found naturally in the body). Do probiotics work for dogs? ​A study by Gómez-Gallego C., Junnila J., Männikko S., et al. (2016) found that a canine-specific probiotic product helped dogs with acute diarrhea in a double-blind study with placebos used as a control. Probiotics with milk helped dogs’ stools become more normal and consistent. These probiotics also reduced pathogenic bacteria which sped up recovery. Are probiotic supplements just gimmicks? ​Some people believe that probiotic supplements are just gimmicks. A study by Weese J.S. & Arroyo L. (2003) showed that dog and cat food claiming to contain probiotics had inaccurate labeling. Since probiotics are unregulated, it’s true that some don’t have the organisms stated, don’t have the right number of organisms, or have organisms other than the ones listed. This doesn’t mean that there aren’t good, reputable probiotics available for dogs. Owners should be wary about claims made on packaging and understand how probiotics work before buying them. Probiotics can be used to clear up a wide variety of problems and are often a cleaner, more natural option than other remedies that are available. Keep in mind that each probiotic does something a little different, so a probiotic with only one strain of bacteria likely won’t have the same effects as one with several different strains. What to look out for in a quality probiotic? ​According to Chow Hounds: Why Our Dogs Are Getting Fatter -A Vet's Plan to Save Their Lives, one of the first things you should look for in a probiotic supplement for dogs is one with at least a billion organisms. Another important thing to keep in mind is that how certain strains of probiotics are administered makes a difference in whether they’re absorbed by your dog. Products should also have a use before date. High quality ones will tell you how many live bacteria there will be at the end of the product’s shelf life, so you aren’t buying a product that will be ineffective by the time you use it. ​Probiotics are heat and moisture sensitive, which makes it very hard to incorporate them into pet kibble (another reason why owners should be skeptical of dog food claiming to contain probiotics). Probiotic products should be stored a cool, dry environment and sealed away from exposure to air. How to give your dog probiotics and when? ​Dogs with healthy digestion probably already have a good balance of probiotics in their system and don’t need supplements unless something changes. According to the American Kennel Club, probiotics for dogs are generally used when a dog has symptoms like diarrhea, gas, and bad breath from stress or illness. Other things like medication, diet, and parasites can also throw a dog’s healthy bacteria off-balance prompting the need to supplement. Since there are so many kinds of dog probiotics it’s important for owners to always follow the instructions on the label when giving them to their dogs. Generally, probiotics for dogs are given orally in their food or along with a treat. Nusentia makes a premium probiotic product for dogs and cats called Probiotic Miracle. This professional quality probiotic supplement contains over 360 billion CFU probiotics per jar and up to 360 servings per container. It’s made in the USA, is scientifically researched, and is recommended by vets and breeders. This probiotic is tested by a third party to ensure that it is safe, pure, and potent. Some of the conditions that this probiotic helps with include: diarrhea, loose stool, yeast overgrowth, bad breath, constipation, itching, scratching, allergies, digestive issues, and other gut conditions. This supplement uses quality ingredients and doesn’t contain any rice, maltodextrin, gluten, GMO ingredients, dairy, soy, fillers, flavorings, odors, or by-products. For this type of probiotic, all you must do is sprinkle it on your pet’s food and mix it in. The directions say to give one scoop to animals under 50 lbs and 2 scoops to animals over 50 lbs. Sensitive dogs should start with half the serving and gradually increase. This product lasts up to a year when stored at room temperature and contains 6 researched strains of probiotics. 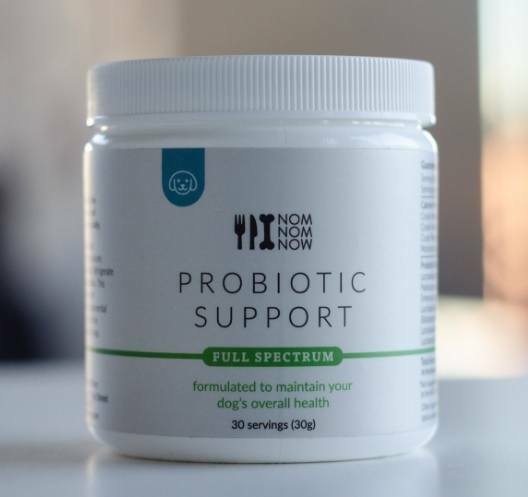 NomNomNow:SUPPORT created by a team of veterinary nutritionists and microbiologists is another excellent choice of a full spectrum of prebiotic and probiotics blend for maintaining healthy digestion and promoting health in your pet. It features seven strains of dog probiotics and contains 20 billion CFUs (live cultures) per serving. The full spectrum of strains found are: Bifidobacterium animalis, Enterococcus faecium, Lactobacillus acidophilus, L. reuteri, L. fermentum, L. rhamnosus and Pediococcus acidilactici. Whether you're looking to guard the health of your pet's entire digestive track, stabilize their intestinal microflora or eliminate out the bad, pathogenic bacteria - this enriched blend has your pet covered. It comes in powder form with a serving scoop and the recommended use is to add a single scoop to your dog’s food once a day. (Serving size is the same for dogs of any size). Purina makes a probiotic for dogs called FortiFlora that comes in individually packaged servings. This product uses bacteria found naturally in dogs’ digestive systems to manage and shorten episodes of diarrhea caused by things like food changes, antibiotic therapy, and environmental stress. This product also promotes a healthy immune system and is high in antioxidants and vitamins A, C, and E.
This product is designed to be palatable to dogs and contains a guaranteed amount of live active cultures. The minimum guaranteed amount of live cultures is one hundred million CFU/g. The main strain of probiotics used in this formula is Enterococcus faecium SF68, which inhibits growth of pathogenic bacteria such as Shigella, Salmonella and E. coli. The packaging says to use this product only as directed by your veterinarian. It’s a powdered probiotic that comes in pre-measured packets that are sprinkled and mixed into your dog’s food. FortiFlora is made in the USA and is a well-known, bestselling, digestive remedy for dogs. Many owners have highly rated this product, but it can be a little expensive compared to alternatives. Dr. Mercola’s Complete Probiotics for Pets can be used to promote proper gut flora, a healthy immune system, and a healthy intestinal tract in dogs as well as cats. This probiotic powder is made in the USA and contains 14 strains of bacteria. Each scoop of this probiotic contains 38 billion CFU bacteria that remove harmful toxins and improve digestion, while also aiding in the production of B vitamins, folic acid, biotin, and vitamin K. This formula improves dogs’ digestive health by helping their bodies break down and absorb nutrients from fats, carbs, and proteins. Owners looking to use this product for daily maintenance should give their pet one portion of the powder mixed in with their food, once a day. The proper portion is measured based on your pet’s weight, from ½ a scoop for cats who are 2+ lbs. to 3 scoops for dogs who are 80+ lbs. This highly rated probiotic is backed by 20 years of experience making premium supplements. VetriScience Labratories has created a Mega Probiotic product for cats and dogs in capsule form. This veterinary approved supplement is a non-dairy formula produced by an all-natural source of microorganisms. Each capsule is guaranteed to contain 5 billion microorganisms with 8 different strains of bacteria. Since it’s in capsule form, owners can choose to open the capsule and sprinkle the content in their dog’s food or hide the capsule in a treat for their dog to eat. Owners whose dogs suffer from stress-related health problems, food sensitivity, allergies, or regular digestive upset (like flatulence, diarrhea, and constipation) can benefit from this prebiotic supplement. Other benefits of this probiotic include fresh breath, healthy skin and coat, and neurological support. The feeding directions for dogs are one capsule per day for those who are under 40 lbs., and two capsules per day for dogs over 40 lbs. (preferably after a meal). The label says to store this product in a cool, dry place at a temperature that isn’t higher than 70 degrees. Dog Probiotics - Yay or Nay? 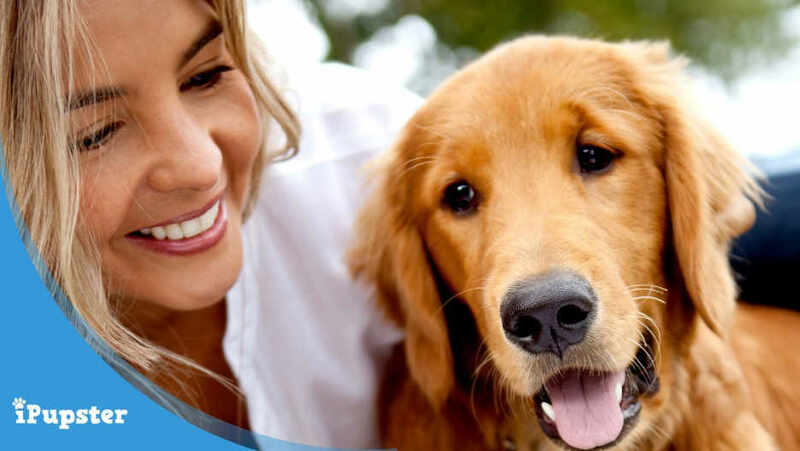 Probiotics are becoming increasingly popular with dog owners as people realise that these bacteria can have similar benefits to animals as they do to humans. If you’re thinking about supplementing your dog’s diet with probiotics or using them to help treat digestive issues, you should know that early studies and evidence from vets and owners shows that probiotics can be effective. However, owners should understand probiotics before giving them to their dogs. It’s important to know what to look for and what to avoid because probiotics aren’t regulated by the FDA. Some studies have shown that products for animals, like kibble that’s fortified with probiotics, may make claims that are false or misleading. Some of the best options for dogs are powder and capsule probiotic supplements.